Ancient Hawaii boasted no large land mammals, but with the arrival of Western ships, new plants and animals soon found their way to the Islands. The simple-seeming gift of a few cattle given to Kamehameha I by Captain George Vancouver in 1793 made a major impact on the Hawaii's economy and ecosystem. 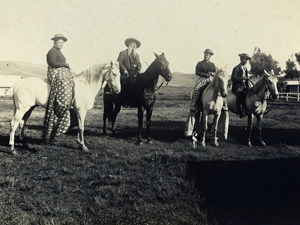 It also spawned a rich tradition of cowboy and ranch culture that is still visible today. Spaniards introduced the first cattle to Veracruz, Mexico in 1521. Vancouver picked up descendents of these animals from the Spanish mission in Monterey, California when he set off across the Pacific, intending to use them as food and gifts. The first cows and bulls given the Hawaiians fared poorly, either falling ill and dying or were quickly killed and eaten. When Vancouver landed additional cattle at Kealakekua in 1794, he strongly encouraged Kamehameha to place a 10-year kapu on them to allow the herd to grow. The 10 year kapu turned into a 37 year kapu. It was not lifted until 1830 during the reign of King Kamehameha III. During the past three plus decades the herds had grown and had turned into a dangerous nuisance. By 1846, 25,000 wild cattle roamed at will and an additional 10,000 semi-domesticated cattle lived alongside humans. A wild bull or cow could weigh 1,200 to 1,500 pounds and had a six-foot horn spread. Vast herds destroyed natives crops, ate the thatching on houses, and hurt, attacked and sometimes killed people. 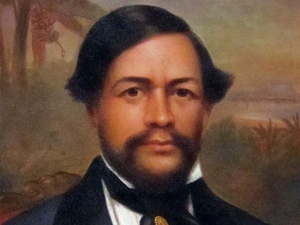 In 1830 King Kamehameha III lifted the Kapu on cattle and encouraged hunting. The Hawaiian style of ranching originally included capturing wild cattle by driving them into pits dug in the forest floor. Once tamed somewhat by hunger and thirst, they were hauled out up a steep ramp, and tied by their horns to the horns of a tame, older steer that knew where the paddock with food and water was located. 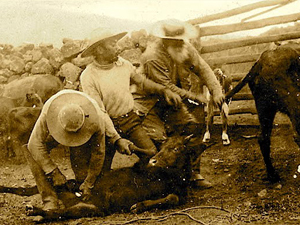 The king hired bullock hunters from overseas to help in the effort. Many of these were former convicts from Botany Bay in Australia. 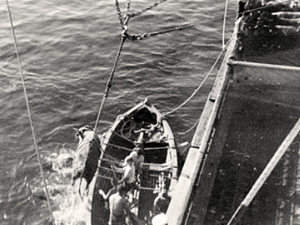 Hunting sometimes ended in inadvertent tragedy. In 1834, the trampled dead body of Scottish botanist David Douglas, for whom the Douglas Fir is named, was discovered a bullock pit on Mauna Kea. Though suspicious head wounds and a quantity of missing cash also implied murder, bullock traps caught humans and other unsuspecting humans with alarming frequency. 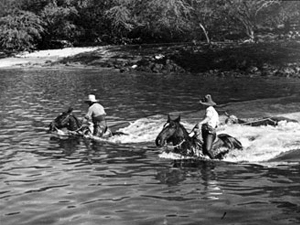 Cattle were not the only animals introduced to Hawaii during this period. In 1778, Captain Cook had left both goats and pigs with natives. 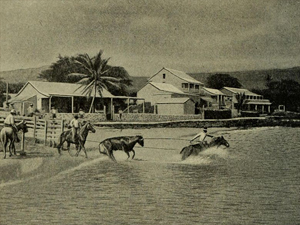 In 1803, American Richard Cleveland presented horses, a stallion and a mare, to Kamehameha. British introduced sheep in the 1790s and they soon damaged the native forests of Mauna Kea and Hualalai at the same time failing as an economic crop. In 1832, Kamehameha III sent one of his high chiefs to California to hire cowboys who could round up wild cattle and teach Hawaiians cattle and horse handling skills. 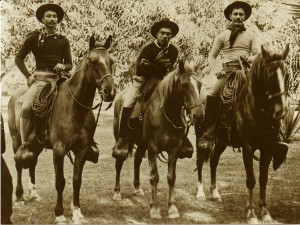 Three Mexican-Spanish vaquero (cowboys) named Kossuth, Louzeida and Ramon began working on the big island of Hawaii, first breaking in horses to turn them into working animals, then rounding up and handling hordes of cattle. 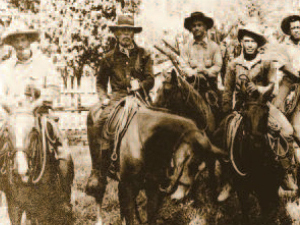 Hawaii's cowboys became known as paniolo, a corruption of español, the language the vaquero spoke. 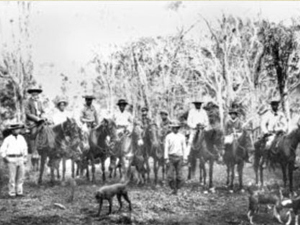 The term still refers to cowboys working in the Islands and to the culture their lifestyle spawned. Hawaiians proved themselves avid students, quickly picking up horsemanship, roping and other skills. 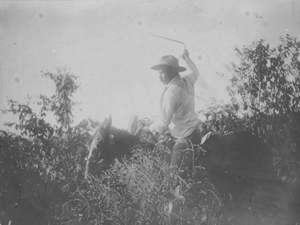 Hawaiians became paniolo before the territories of the American West had cowboy or ranch traditions. 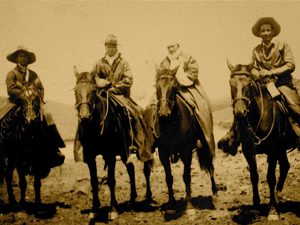 Cowboys in the Pacific Northwest got their start in 1846; in California and Texas it was 1848. Because Hawaiians began their work with cattle and horses earlier, their paniolo traditions were strongly shaped by the Mexican vaquero heritage that stemmed originally from Spain. Even today, traditional paniolo dress, as well as certain styles of Hawaiian formal attire, reflect the Spanish heritage of the vaquero. 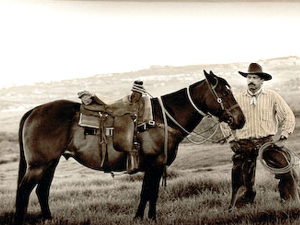 The traditional Hawaiian saddle, the noho lio, and many other tools of the cowboy's trade have a distinctly Mexican/Spanish look and many Hawaiian ranching families still carry the names of the vaqueros who married Hawaiian women and made Hawaii their home.